For over a month, I had something that belonged to my close friend Buzz. I kept meaning to mail it to him (as I had promised), but it repeatedly slipped my mind until I became the mayor of Badfriendsville. He came to visit last weekend and I knew I had to seize the opportunity to make it up to him (as well as return what I still hadn’t mailed). How, you ask? Well, Buzz is a cookie fanatic. It is an understatement to say that cookies are his favorite food..in fact, I think he may even consider them an essential food group (can’t say he’s wrong, really). He thinks about cookies and starts drooling. I knew I had to bake a cookie that would knock his socks off. Fortunately, I can always count on Sally to come to the rescue at a time like this. I had been dreaming about one of (okay…all of) her cookie recipes, and was secretly grateful for the convenient excuse to finally try it out for myself. 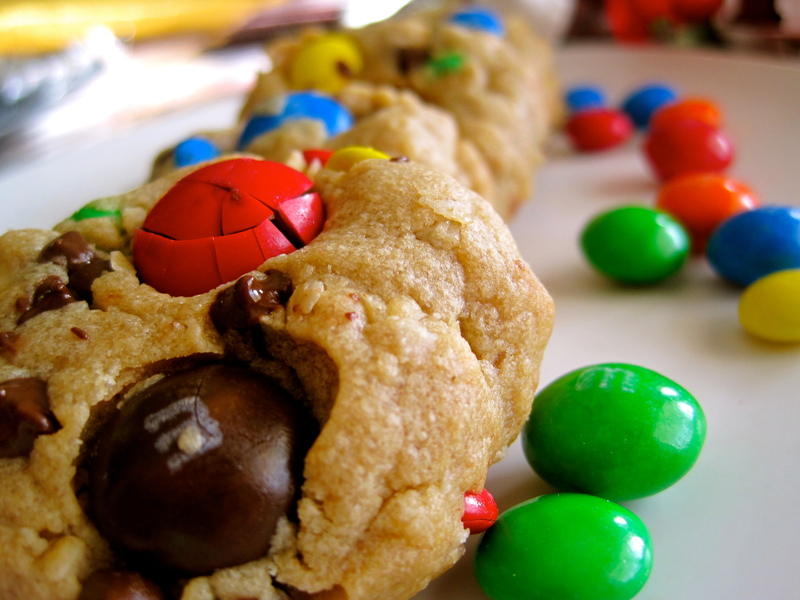 What, exactly, is a monster cookie, you ask? It’s the mother of all cookies. 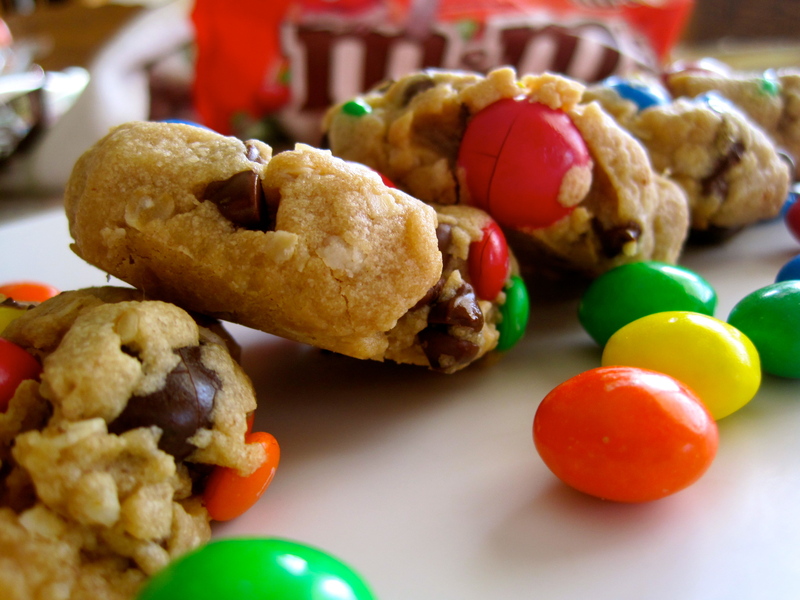 It’s a peanut butter oatmeal chocolate chip M&M cookie. What makes Sally’s monster cookies special? Well, the amount of peanut butter and brown sugar in this recipe gives the cookies an amazing softness that lasts for days after. In fact, they become softer as the days pass. 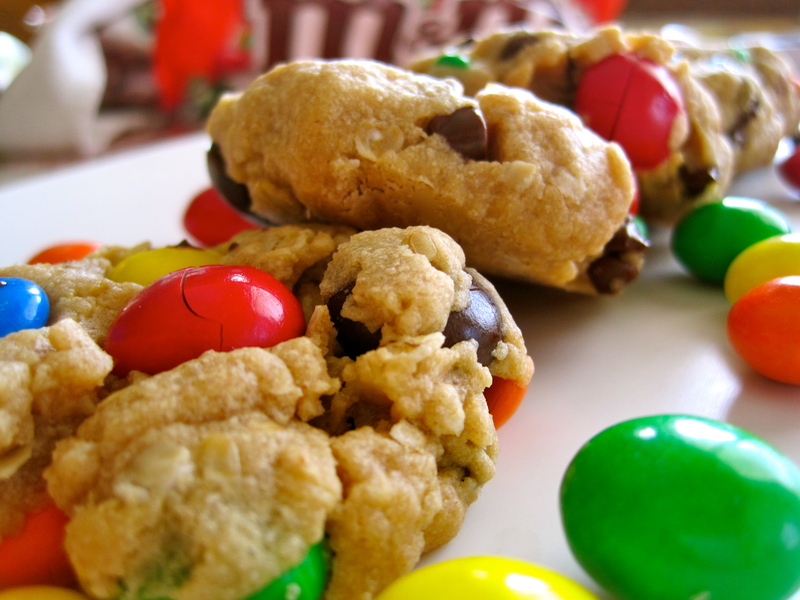 It could also be the combination of peanut butter M&M’s, regular M&M’s, and mini M&M’s that makes each bite unique and full of texture. Yes, that is my Statistics textbook. No, that is not an illusion. 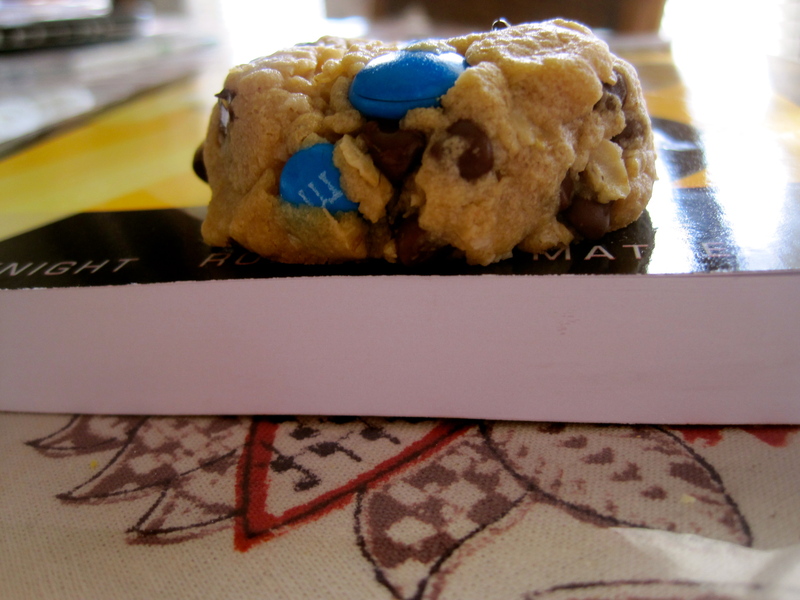 And yes, the cookie is thicker than the book. Whatever it is that makes these cookies magical, all it took for Buzz to forgive me was one bite. And then he continued to eat over a dozen cookies throughout the next 12 hours. I divided these up and shared them with several friends, and the response was the same each time. They are incredible. Just a warning: they will make you drool, so try not to wear white when you’re biting into one of these cookies. So there you go. One bite of these magical monster “forgive me” cookies and the world will melt in the palm of your hand. 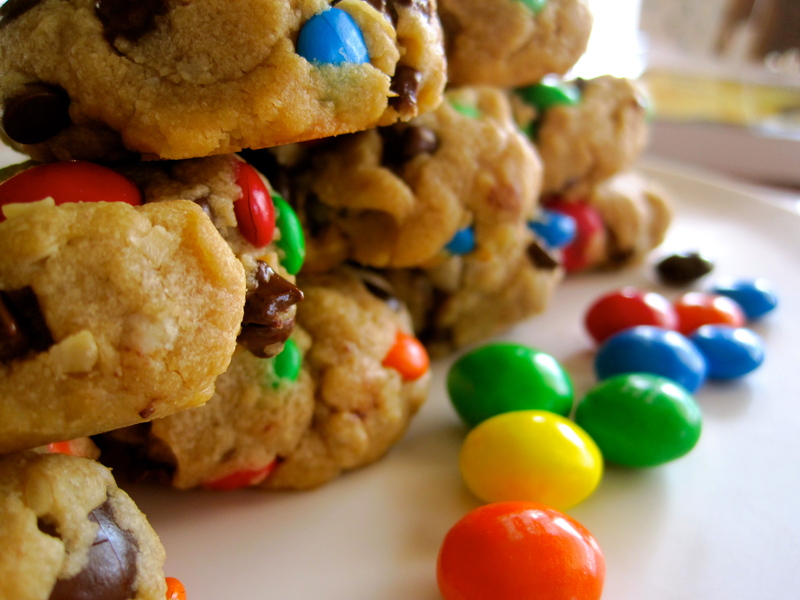 This entry was posted in Anecdotes, Food, Misc, Recipes and tagged chocolate, chocolate chip, cookie, cookies, delicious, dessert, easy, food, forgiveness, forgiveness cookies, m&ms, monster, monster cookies, oatmeal, peanut butter, recipe, recipes. Bookmark the permalink. So glad you love my cookie recipes. 🙂 That makes me happy! These cookies in particular make me SO happy! I love how colorful they are. Yours look amazing! And I love how thick they always are!